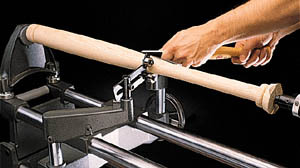 Reduce whip, chatter and possible stock breakage when turning long spindles or thin diameter stock on your Shopsmith MARK V or other lathe. Accepts stock from 3/16-inch to 3-1/2-inch diameter. Ball bearing construction. Go back to the Lathe Tool Rest Index!